A unique design project implemented by Stevens & Wilkinson Stang & Newdow, Inc. for Kennesaw State University’s new Social Science classroom building has not only been well received by both faculty and students, but has also achieved Silver LEED (Leadership in Energy and Environmental Design; there are four levels – Certified, Silver, Gold, Platinum) certification. Stevens & Wilkinson Principal Bill Clark, AIA, LEED AP, made the announcement. The five-story, 164,000 square-foot classroom building houses more than 40 classrooms and office space for five academic departments (Communications, History & Philosophy, Political Science & International Affairs, Psychology, and Sociology) within the College of Social Science. Interior spaces include a 300-seat auditorium, 110-seat film classroom and a large indoor student plaza with access to an exterior covered porch. Previously the classrooms and offices for the Social Sciences were housed in different buildings across campus minimizing collegial interaction between students and faculty. The new building has consolidated the classrooms, and departmental and faculty offices into one central teaching facility. “The facility is not only visually appealing, but also energy and water usage/costs are significantly reduced and it’s an overall healthier interior environment for both students and faculty,” Clark said. The exterior palette was designed to blend in with the surrounding environment and buildings. One innovative design feature was developing comfortable student study areas on the north and south sides of the building – normally the kind of space that is classified as unassigned circulation space. The university, however, wanted this space developed to foster a collegiate atmosphere where students and faculty could interact other than in a classroom. There are several large (+1,100 square feet) departmental research centers in the building designated for various long-term research projects (18-36 months). 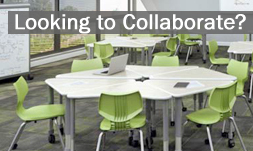 Classroom furniture is flexible and modular and conducive for group projects and discussion. Most classrooms also have wireless technology.